You are at:Home»Grub»Day 2 of our Whole30 Pre-Summer 30Day Challenge!! Day 2 of our Whole30 Pre-Summer 30Day Challenge!! This romesco sauce is extremely versatile and can accompany almost any meat. I find that paring it with salmon really brightens the fish and is a refreshing spring dish for everyone. 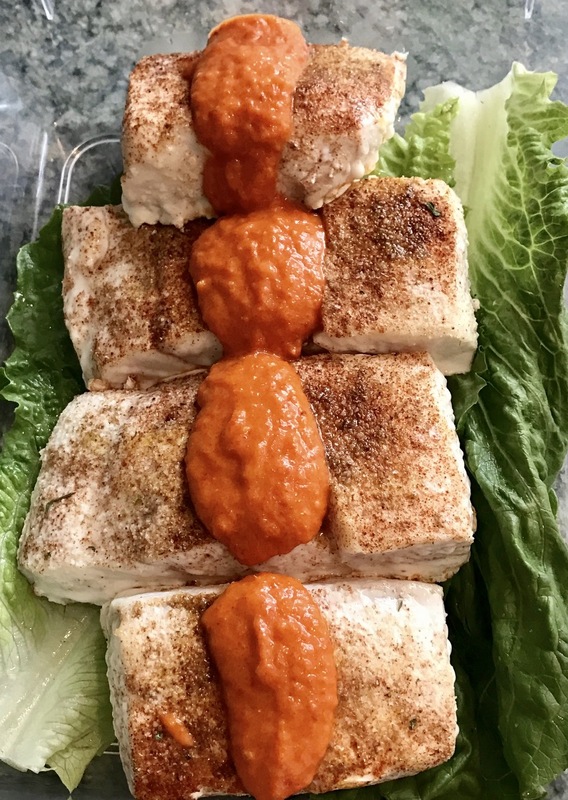 The recipe provides a huge dose of heart-healthy omega-3s, found in both the salmon and the almonds in the zesty romesco sauce. Pat the salmon dry with a paper towel. Sprinkle each salmon piece evenly with the salt, pepper and smoked paprika. Heat a large non-stick pan on high heat and add the oil. When the oil begins to shimmer, carefully add the salmon onto the pan. Sear each piece of salmon for 2 to 4 minutes on each side, until a crust forms. Carefully place the salmon skin side down onto a foil-lined baking pan and transfer to the oven. Roast for 8-10 minutes, until the fish is just cooked through.